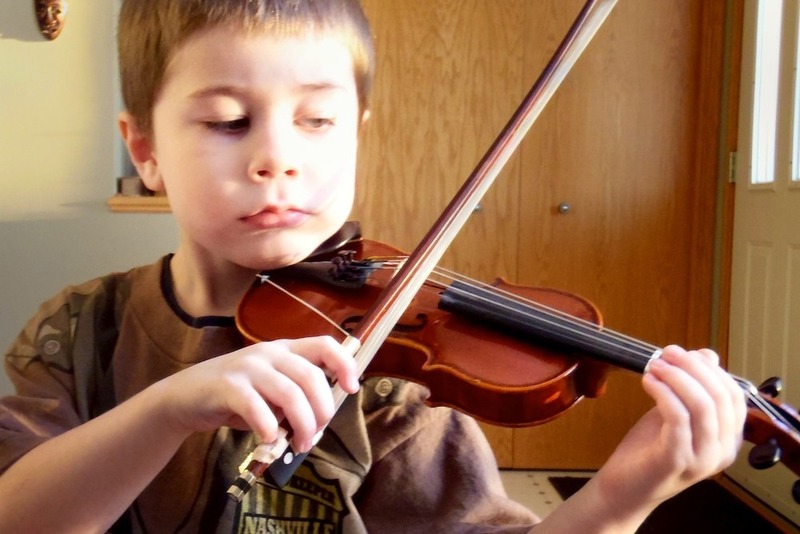 Why do you (and/or your child(ren)) play a stringed instrument (or take any music education for that matter)? My reasons for playing an instrument have varied wildly; everything from enjoying the sound of beautiful music to simply not wanting to disappoint my teacher. Sometimes it’s the freedom of letting everything else go while I concentrate on a piece. Sometimes it’s the rush of adrenaline from performing. Other times its the comradeship of playing in groups. But sometimes my only motivation is not being a ‘quitter’. Even lackluster motivation like that will work (for very short periods). While I’ve had many motivational shifts and swings, fame has never entered into the equation. So hearing about it from my son this morning was as baffling as it was comical. Today my son’s practice started off as many of our less-than-pleasant practices do. There was his slog of a journey down the staircase after my third appeal. There was breath-holding and bobble-heading while I summarized our goals for the morning. There was the instrument power-struggle as we attempted Monkey Song on the D string. Finally, there was a kind of warp-speed galloping through review pieces. Somewhere between Go Tell Aunt Rhody and May Song, I made the mistake of mentioning our need to be at school in two minutes; putting both of us in full-scale panic mode. The result was a mell-of-a-hess-of-a-folk-song rushed, less than ideal piece of music. His ambitions for *fame* never occurred me. I’d always considered his music lessons an educational pursuit; not something to bring notoriety. While I don’t want to squash my son’s ambition, the thought of having fame as our goal would make daily practice on folk songs feel a little like trying to climb Mt. Everest in Uggs and Spandex shorts. A plan to focus on the more immediate benefits of music education seems much more helpful. In fact, Carolyn Phillips of the Norwalk Youth Symphony has compiled a great list of them: The 12 Benefits of Music Education. Staying motivated is easier when purpose is clear… when we really *feel* why we’re doing something. So here’s a question for *parents* of string players – Why is your child(ren) are learning play a stringed instrument? Are the reasons yours, theirs or both and… are those reasons the same?